Time to pull out the TOGA!!! 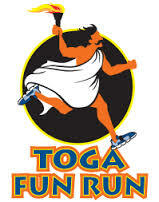 St. John the Theologian Greek Orthodox Church is proud to present the 7th Annual Toga Fun Run! Come join us May 12th at Clear Lake Park, 5002 Nasa Parkway, Seabrook. This year we will be donating a portion of the race proceeds to Todays Harbor for Children in La Porte. So come have some fun and lets help these kids out! We will start the day with a group warm up/stretching followed by the Kids 1K, which will begin promptly at 8am. The 5K run will begin immediately following the 1K. The route will begin at Clear Lake Park, go through the Clear Lake Forest subdivision, up Kirby to Nasa Parkway and Finish back at the park. The 5K will have bib timing for those wanting an official time. Don't rush off when your done! Enjoy some healthy snacks, multiple door prizes and age group awards. Age groups for this race are: 13 and under, 14-19, 20-29, 30-39, 40-49, 50-59, 60 and over. There will be a 1st, 2nd and 3rd place male and female for each age group. THATS NOT ALL! We will award the overall male and female and of course the BEST TOGA AWARD! Registration includes FREE admission into the Clear Lake Greek Festival and a FREE Toga Run T-Shirt. Gulf Coast Clinic of Chiropractic, 3659 Nasa Parkway, Ste F, Seabrook on Friday, May 11th, noon-6pm. Race day packet pickup will be 7:00am-8:00am near the starting line. Race day packet pick up will begin at 7am. Please arrive in time to check in and be ready to begin the race on time. We will have a group led warm up for those wanting to participate. The Kids 1K will begin promptly at 8am, followed by the 5K. Start/finish line will be to the right of the park entrance. Upon arrival you will be directed to park in the small lot on the left of the entrance to leave the path clear for runners. The 1K course will keep the kids in the park. The 5K course will go through the Clear Lake Forest subdivision, up Kirby to Nasa Parkway and back to the Park.